A.J. 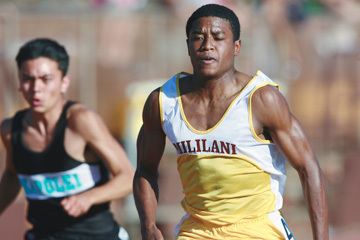 Clark of Mililani finished second in the 100-meter-dash trial and first in the 200 and 400 yesterday. Trials provided tribulations for the boys from Mililani and Kahuku yesterday at the Trojans track, but they still figure to be the favorites in tomorrow's Oahu Interscholastic Association championships. Host Mililani had every reason to consider its title defense hopes dashed in the first running event, when star D'Andre Benjamin fell in the 110 high hurdles and did not qualify. But Kahuku soon provided a miscue of its own, with a dropped baton in the 4x100-meter relay. That could cost the Red Raiders up to 10 points, but it might be a good omen. "Well, we were DQ'd in the 4x100 in 2003, but we somehow managed to win the meet," coach Sean Makaiau said, speaking of Kahuku's previous OIA championship during his reign. Senior Redmond Tutor is the big reason the Red Raiders might be able to afford the error. He matched the meet record in the 300 hurdles, cruising to 39.44. Benjamin won his heat in 41.10, setting up a race tomorrow that could be a microcosm of the meet -- Mililani fast, but Kahuku a little bit faster. Tutor was also tops in the 110 hurdles (12.60), long jump (22-9 1/2) and triple jump (46-6 1/2). "I got a PR in the triple jump, so I'm hoping I can break the record Saturday," said Tutor, who will be going after the 20-year-old standard of 48-6 set by Campbell's Larry Khan-Smith. B.J. Beatty also helped give Kahuku probable first-place points with a 153-5 discus heave, and Patrick Au has the shot put lead with a 45-1034 toss. The Red Raiders' Suaesi Tuimunei was the top qualifier in the 100 meters with 11.18. But Mililani's A.J. Clark was just a 100th of a second behind. Clark was the fastest qualifier in the 200 and 400, and the Trojans need plenty of points from the University High transfer -- as well as in the relays -- to give Kahuku a run for it. The Trojans qualified second in the 4x100 that Kahuku flubbed, but Clark said the Mililani quartet is not in tune. "We messed up a bit, but we'll have it ready by Saturday," he said. "In the mock meet it doesn't look like we have a chance, but we're still gonna come out here and try." The Mililani girls are somewhat more confident about repeating. But junior sprinter Britney Stephens said she is wary of Radford, despite qualifying first in the 100 and 200. "This is going to be close. Radford is going to make it close," Stephens said. Rams coach Elizabeth Bunch, a former Radford distance-running star during the era when the school dominated the OIA for more than a decade, tried to downplay her team's resurgence. "We're still building the program," the second-year head coach said. But there's no hiding Rams' senior sprinter Natasha Minor. She qualified first in the 400 (60.95), and will also likely score in the 100 and 200 tomorrow. Tomorrow's first field event is scheduled for 3:45 p.m. with the first running event an hour later.